Maca is an energizing and revitalizing superfood of the Incas. The root has been used by indigenous Andean societies as a source of nourishment and healing for thousands of years, and continues to be one of the most appreciated superfoods today. Used to increase stamina, boost libido and combat fatigue. 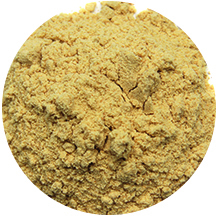 Maca root has long been regarded for its adaptogenic properties. Maca root powder is comprised of approximately 18% protein, 76.5% carbohydrates, 5% fat, and 8.5% fibre. It has a higher fat content than other root crops , of which linoleic acid, palmitic acid, and oleic acid are the primary fatty acids. Maca is also a rich source of plant sterols. From a mineral standpoint, maca exceeds both potatoes and carrots in value, and is a source of iron, magnesium, calcium, potassium, and iodine. Maca powder is commonly added to smoothies, used in baked goods, or added to hot and cold drinks. Maca powder is a desirable additive to gluten-free baking because it imparts a delicious taste while boasting a rich nutrient profile.